Christians make up the largest single religious group within the Asian-American community, but the Christian share of U.S. Asians (42%) is far smaller than the Christian share of the U.S. general public (75%). Only two of the six largest country-of-origin groups are majority Christian: Filipino Americans (89% Christian) and Korean Americans (71% Christian). 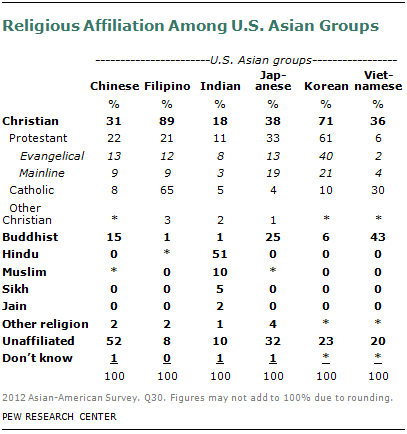 Among other Asian-American groups, fewer than four-in-ten are Christian. Among Asian Americans as a whole, 22% are Protestant, 19% are Catholic, and 1% belong to other Christian groups, such as Orthodox Christians and Mormons. Most Filipino Americans are Catholic (65%), while most Korean Americans are Protestant (61%). Asian Americans as a whole are somewhat more likely than the public overall to be unaffiliated with a particular religion. One-in-four Asian Americans (26%) say they are religiously unaffiliated, compared with roughly one-in-five people in the general public (19%). Religious affiliation varies greatly across the largest subgroups of U.S. Asians. Half of Chinese Americans (52%) describe themselves as religiously unaffiliated, including 15% who say they are atheist or agnostic. A fifth or more of Japanese Americans (32%), Korean Americans (23%) and Vietnamese Americans (20%) also say they are unaffiliated with any particular religion. Filipino Americans and Indian Americans are much less likely to say they are religiously unaffiliated (8% and 10%, respectively). As expected, Buddhists make up a larger portion of Asian Americans than of the U.S. public as a whole. A total of 14% of Asian Americans are Buddhist, compared with about 1% of the general public. Roughly four-in-ten Vietnamese Americans (43%), one-in-four Japanese Americans (25%) and one-in-six Chinese Americans (15%) are Buddhist. Hindus also make up a larger portion of Asian Americans than of the U.S. public as a whole. One-in-ten Asian Americans are Hindu, compared with less than 1% of the general public in the U.S. Nearly all Asian-American Hindus trace their roots to India, with relatively few from other parts of Asia. 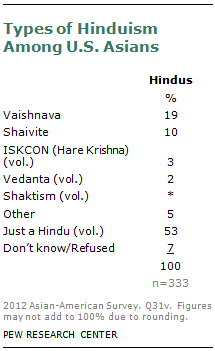 There are a number of religious groups in the Indian-American population, however (see below). While some Asian-American groups tend to have a preponderance of one religion, others have a more even mix. For example, Filipino Americans and Korean Americans are overwhelmingly Christian (89% and 71%, respectively). Japanese Americans, by comparison, are more evenly split: 38% are Christian, 32% are unaffiliated, 25% are Buddhist, and 4% belong to other religions. Among Vietnamese Americans, 43% are Buddhist, 36% are Christian, 20% are unaffiliated, and less than 1% belong to other religions. While about half of Indian Americans are Hindu (51%), 18% are Christian, 10% are Muslim, 10% are unaffiliated, 5% are Sikh, 2% are Jain, 1% are Buddhist, and the remainder belong to other religions. 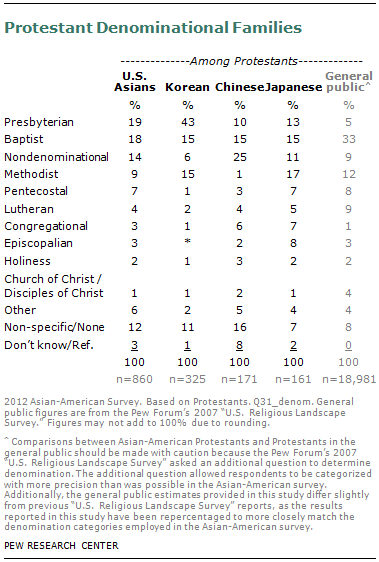 As noted above, Asian-American Christians are almost evenly divided between Protestants and Catholics. Roughly a fifth of all Asian Americans are Protestant (22%), and a slightly smaller percentage is Catholic (19%). In the U.S. public as a whole, about half are Protestant, and 23% are Catholic. Looking at all Asian-American Protestants, there is a higher proportion of born-again or evangelical Protestants (58%) than mainline Protestants (42%).20 Among white Protestants in the general public, 51% say they are born-again or evangelical. About two-thirds of black Protestants (65%) in the general public say they are born-again or evangelical. 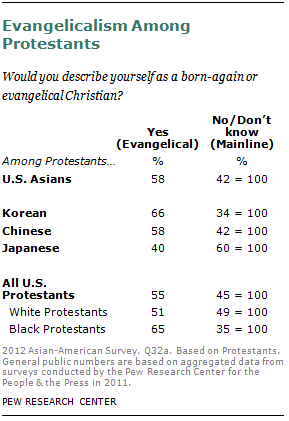 Korean-American Protestants are more likely than other Asian-American Protestants to say they are evangelical or born-again. Two-thirds of Korean-American Protestants (66%) describe themselves this way. The majority of Chinese-American Protestants (58%) also say they are evangelical. The reverse is true for Japanese-American Protestants, among whom 60% are mainline Protestant and 40% are evangelical. 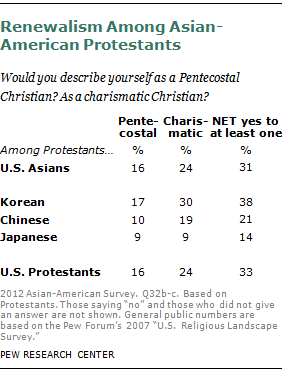 About four-in-ten Korean-American Protestants (38%) describe themselves as Pentecostal and/or charismatic. Fewer Chinese-American Protestants identify as Pentecostal and/or charismatic (21%), and 14% of Japanese-American Protestants do so. The survey sample contains too few Protestants in the other U.S. Asian groups to analyze. Among Asian-American Protestants as a whole, the most common denominational families are Presbyterian (19%) and Baptist (18%). Nondenominational Christians make up 14%. Roughly one-in-ten Asian-American Protestants are Methodist (9%), and 7% belong to Pentecostal churches and denominations.21 Other denominational families each account for less than 5% of Asian-American Protestants. Denominational families differ somewhat across U.S. Asian groups. A plurality of Korean-American Protestants (43%) are Presbyterian, with the remainder coming from other denominational families, including Baptist (15%) and Methodist (15%). A quarter of Chinese-American Protestants (25%) are from a nondenominational or independent church, 15% are Baptist, and 10% are Presbyterian. Among Japanese-American Protestants, the most common denominational families are Methodist (17%), Baptist (15%) and Presbyterian (13%). The survey did not include enough interviews with Protestants in the other three country-of-origin groups (Filipino, Indian and Vietnamese Americans) to analyze separately. About one-in-seven Asian Americans (14%) are Buddhist. 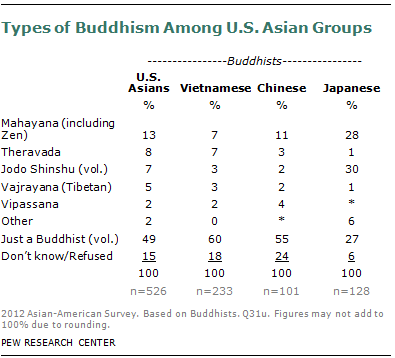 Buddhism is more common among some U.S. Asian groups. Roughly four-in-ten Vietnamese Americans (43%) and one-in-four Japanese Americans (25%) are Buddhist. Among Chinese Americans, 15% are Buddhist. Buddhists comprise no more than 6% of the other major U.S. Asian groups. Nearly six-in-ten Japanese-American Buddhists say they practice either Jodo Shinshu (30%) or Mahayana Buddhism (28%). By contrast, a majority of Vietnamese-American and Chinese-American Buddhists say they are “just a Buddhist” (60% and 55%, respectively). There were too few Buddhists in the other country-of-origin groups to analyze separately. Like Buddhists, Hindus represent a very small percentage of all U.S. adults (less than 1% according to the Pew Forum’s 2007 “U.S. Religious Landscape Survey”). But unlike Buddhists, the overwhelming majority of Hindus in the U.S. are Asian Americans from one country of origin: India. The Pew Forum estimates that 85%-97% of U.S. Hindus are Asian American. Looking at all U.S. Asians surveyed, 10% are Hindu. Roughly half of the Indian Americans surveyed (51%) identify their present religion as Hindu, and 59% say they were raised Hindu. In the U.S., none of the other five large country-of-origin groups has a significant number of Hindus. Indeed, more than nine-in-ten Asian-American Hindus surveyed (93%) say they are of Indian descent, though Hindus also live in such other Asian countries as Nepal, Sri Lanka, Malaysia and Bangladesh. Asian Americans also practice a number of other faiths, such as Islam, Judaism, Sikhism, Jainism and others. (See “Religious Affiliation of U.S. Asians” table.) A total of 4% of U.S. Asians are Muslim. Unfortunately, the survey sample contains too few Asian-American Muslims to allow for separate analysis. The Pew Research Center estimates that 0.8% of the U.S. adult population is Muslim. The Pew Research Center’s 2011 survey of Muslim Americans provides a comprehensive portrait of this religious group, including its religious beliefs and practices as well as social and political attitudes.25 The survey found that Muslims in the U.S. are racially diverse, with 21% describing themselves as Asian.26 In addition, 30% of Muslim Americans describe themselves as white, 23% as black, 6% as Hispanic and 19% as other or mixed race. 27 Appendix 1 provides selected findings for Asian-American Muslims (including comparisons with U.S. Muslims as a whole) from the 2011 survey, which was conducted not only in English but also in Arabic, Farsi and Urdu. Members of many other religious groups—including Baha’is, Confucians, Jains, Jews, Shintoists, Sikhs, Taoists and Unitarians, to name just a few—participated in the survey of Asian Americans. They are included in the overall results for all Asian Americans, but the survey sample does not include enough individuals from these religious groups to allow for separate analysis of each group. 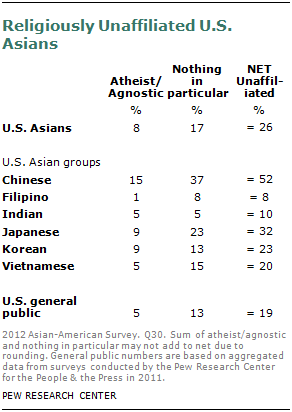 About a quarter of U.S. Asians (26%) say they are atheist, agnostic or have no particular religion. Asian Americans are somewhat more likely than the general public to be unaffiliated with any religion. About a fifth of the general public (19%) has no religious affiliation, a group that has been growing over time, particularly among younger adults. 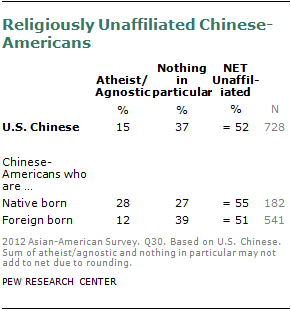 Half of Chinese Americans (52%) describe themselves as religiously unaffiliated; this includes 15% who say they are atheist or agnostic and 37% who describe their religion as “nothing in particular.” While Chinese Americans come primarily from mainland China—where the ruling Communist Party is officially atheist and there are very high government restrictions on religion—some also come from Taiwan, Hong Kong and other places.28 Roughly equal portions of U.S.-born (55%) and foreign-born (51%) Chinese Americans have no religious affiliation. However, native-born Chinese Americans are more likely than foreign-born Chinese Americans to say they are atheist or agnostic (28% vs. 12%). Nearly a third of Japanese Americans (32%) are religiously unaffiliated. Here, too, about equal portions of U.S.-born (31%) and foreign-born (34%) Japanese Americans have no religious affiliation. A fourth of Korean Americans (23%) and a fifth of Vietnamese Americans (20%) are religiously unaffiliated. By comparison, fewer Filipino and Indian Americans have no religious affiliation (8% and 10%, respectively).